Becca and Brian's Grand Adventure: Good Afternoon Vietnam!!! - The breaking point of in-Bus entertainment was reached on our way back to Phnom Penh. On the various trips through Asia, if you pay a few extra bucks for air conditioning (which we've done as we've headed south into the 90-100 degree temps) you also get subjected to SE Asian in-route entertainment. This mainly entails video "karaoke" where cloying (at times screeching) songs are played at full blast while the same boy/girl meets boy/girl, fall in love with soft lighting, and lose boy/girl videos play over and over with the words scrolling karaoke style across the bottom. This is occasionally replaced by live "action" stage shows with scary bollywood type costumes with the same words scrolling. I don't know if it would make it better or worse if people sang along, but somehow they restrain themselves. The music is so loud that we can't listen to our own on the ipods. Today the music was so loud that we threw in our earphones just to blunt the painfully loud screeches. What pushed us over the edge was the "movie" that got shown on the way back to PP. It was low budget, shot on video, not film, had terrible acting (though one 'gangster' was tastefully dressed in a Stone Cold Steve Austin t-shirt -ed) , and basically consistent of annoying and unattractive people screeching and yelling at each other in whiny voices for 1.5 hours. I think it was supposed to be a farce, though I certainly wasn't laughing. The volume was turned up so high though that we kept wincing and checking each other to see if brain fluid was dripping out of our ears or noses. If it had gone on much longer they might have found us curled up in the fetal position whimpering when they unloaded the bus. Sounds like fun, no? Thankfully today's trip to Vietnam was much more subdued from that perspective. - The Cambodian/Vietnam border was "interesting". The Cambodian side was no problem. The Vietnam side has all sorts of fun. We walked into the office and promptly someone said "passport" grabbed our passport out of our hands and went over to a table. We realized that they were filling in our entrance forms, for a price (in this case $1 each). For those that felt self sufficient enough to do it themselves, they were met with a brush off and in one case what I think was a threat of bodily harm. You'd think we were in Chicago or something. Best part? They were "official", complete with Vietnamese government badges. They hassled me for even looking at mine to make sure the info was correct. Guess that made the decision not to complain about my gender not being checked an easy one. From there we got to go through three separate checkpoints, one additional bribe (at least we got a receipt for it) and a friggin' x-ray machine. After all that, a well placed duty free shop proved a tempting but eventually unused distraction. - One final note. 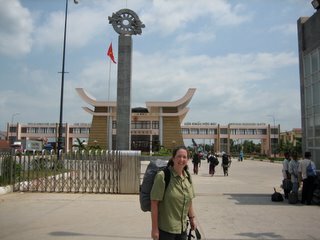 After six plus weeks in Laos and Cambodia crossing the border into Vietnam was a shock. Fully paved roads, sidewalks, a KFC and a hot water shower told us we'd reentered "western" civilization whether we like it or not. And to be honest, I'm not sure we do. Not only is the blog entry title a nice variation on the famous Robin Williams line (prompted by my email? ), it ties in nicely to your comments about the horribly loud "entertainment" on the bus. I guess you'll never complain about the in-flight movie selection on a US airline ever again, huh? US airlines have in-flight entertainment? Where do you fly to? I usually get shuttled through enough airports that there's no such thing. ps yes, it was partily prompted by your email. Wow...such affluence...soft lighting and ticker displays. Truly, those movies must rock.